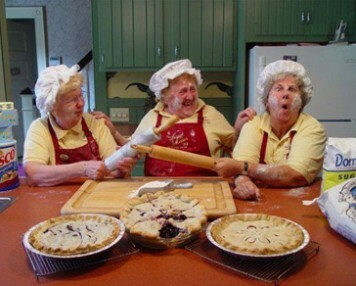 The “Pie Moms” are a special treat to the Berry Manor guests. They really are the Moms of the Inn’s owners! Janet is Mike’s mom, and Ally is Cheryl’s mom. They are the ones who keep our guest pantry stocked with home made pie. 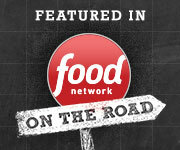 The Pie Moms have been featured on both local and national television. We understand that sometimes when you travel you don’t always feel like having dessert at dinnertime or can’t always finish your meal and want to have it later in the day. We provide two guest pantry areas for our guests, one in the main house and one in the carriage house at our Rockland / Camden accommodations to help meet these needs. Each area has an instant hot water dispenser, glassware, china, cutlery, microwave and full refrigerator and freezer. 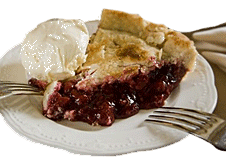 We stock the pantry with assorted teas, coffee, sodas, juice, ice, the “World’s Best Vanilla Ice Cream” Maine-made Gifford Ice cream and of course homemade pies made by the Berry Manor Inn Moms featured on the Food Network and Dirty Jobs with Mike Rowe! There is room in the fridge for medicine, special foods, and leftovers or to chill a bottle of your favorite wine. The Berry Manor Inn Pie Moms are Mike’s mom, Janet, Cheryl’s mom, Ally and our spare mom Anne. They were our original work force when we first opened the inn in 1999. Through the years Ally and Janet baked pies for our guests every day until they finally retired and passed the rolling pin and their recipes to Cheryl. Now Ally is at the inn only in the summer months and for the holidays to supervise our pie making and to remind Cheryl that perhaps with practice her pies might get perfect!!! Stay and discover why Berry Manor Inn was named one the most romantic getaways in Maine.